10.20.08 The Eastern Maine Open will be played on Saturday, October 25, 2008 at the University of Maine Orono Memorial Union in the Bumps Room. The tournament will offer four sections (Open, U1400, U1000, U600) with prizes in each and additional prizes for classes expert through class G. Hope to see you in Orono this Saturday! 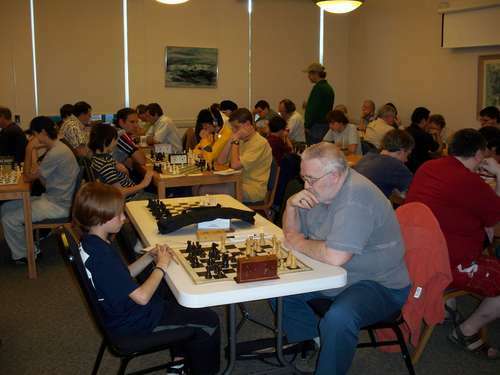 Peter Campbell (left) and David Rice play in the 2007 Eastern Maine Open at the University of Maine Orono.